All Our Tools Are Belong To You! Welcome to the second part of our Open Source series. Today we’re releasing moost, a C++ library with all the nice little tools and utilities our MIR team has developed over the past five years. If you’re a C++ developer yourself, you might notice that moost sounds quite similar to boost, and that’s on purpose. moost is the MIR team’s boost, there is hardly a project in our codebase that doesn’t depend on one or more parts of moost. There are a lot of different things in moost. Some are really simple, yet very helpful in day-to-day work, like the which template that allows you to use pairs (and containers storing pairs) more easily with standard algorithms; or stringify, a function template that turns complex objects into strings. Other parts are slightly more sophisticated: for example, moost contains the framework that is shared by all our backend services, and that allows you to write a daemonisable service with logging, a set of standard options and even a service shell that multiple users can connect to when the service is running, all in a few lines of code. As our backend services are inherently multi-threaded, there’s also a bit of threading support in moost. For example, the safe_shared_ptr template is immensely useful for resources that are shared between threads and need to be updated atomically. If you’re working with large, static datasets, you’ll probably find the memory mapped dataset classes interesting. They allow you to build large datasets (like gigabytes of data) of vectors, multimaps or dense hash maps that can be simply mapped into memory — and thus shared between different processes — and accessed very much like a constant standard container. moost also contains an abstraction for loading shared objects and instantiating objects defined inside these shared objects. It will take care of all the magic involved to avoid resource leaks. There are more bits and bobs in there, like a simple client for the STOMP protocol, hashing and message digest functions, wrappers for key-value stores, template metaprogramming helpers and even a complete logging framework. So check it out, play with it and if you’ve got some nice tool to add, please contribute! There’ll be more code coming up later this week that makes use of moost, so if you’re looking for some hands-on examples, stay tuned! Here at Last.fm we love Open Source. Most of the time we’re just using a lot of Open Source Software, sometimes we’re contributing changes or fixes back to existing projects, and sometimes we release our own software to the public. This week, we’ll be releasing some exciting projects to the C++ community. The first of these projects is a build system we’ve conceived for our C++ codebase and which has helped us a lot — and it might be useful for you, too! 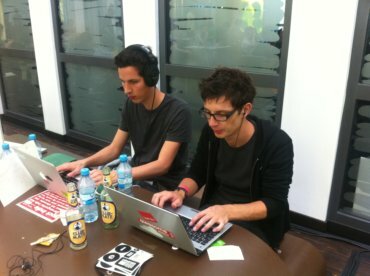 Last.fm’s MIR team is responsible for maintaining more than a hundred libraries, tools and backend services, most of which are written in C++, although some projects are in Python, Perl or Java. Back in 2011, all these projects had to be built from one giant Subversion repository, they contained hard-coded relative paths to other projects they depended on, yet as developers we would still have to know all the dependencies and build them in the correct order to actually build the project we were interested in. Also, every project contained a lot of boilerplate code and over time, this code changed, so it could be substantially different between any two projects. All of this made it quite painful to build projects or set them up for continuous integration, let alone distribute them to our production servers. As we were thinking about migrating our codebase to Git, we wondered whether there was an easier way to build our projects. Our ideal solution at that point would have been a tool that allowed us build, test, install and package every project, regardless of the language it’s written in, with exactly the same command. We couldn’t find anything like that and so we decided to write our own tool, which we called mirbuild (for hopefully obvious reasons). and it “just works”. But mirbuild does a bit more than just forwarding commands to CMake. For example, it will create a file that controls compile flags and include and link paths of project dependencies. It will also create a version header for your project if you ask it to do so. Over the last one and a half years, mirbuild has saved us from a lot of grief and it has made building projects a lot of fun. Thanks to mirbuild, we’ve also simplified our continuous integration framework and have now got all our production packages built on disposable virtual machines (but that’s a different story). If you’re maintaining lots of C++ code and aren’t happy with how you’re building it, check it out, it’s on Github. Hello, scrobble fans! Were you wondering where your desktop app updates had gone? Well wonder no longer! With the last major version released back in 2007 (those were the days, eh?) you’d be forgiven for thinking there weren’t any more coming, but we’ve actually been hard at work on an update to bring us crashing into 2008, a little late. We released this new desktop scrobbler as a beta a little under a year ago and have been spending the time since getting it ready for launch. A couple of weeks ago (15th Jan) that launch day finally arrived and we pushed it out to everyone on Windows, Mac, and Linux! If you’ve not already got it you can head over to our download page for a fresh copy. Here’s a Youtube.com video of us reaching 200,000 authenticated users on the new app: https://www.youtube.com/watch?v=vy_VwcGazE4. Just look at how much fun we’re having! The app comes with a new design and some features we hope you’ll really love. There’s a now playing tab where information about your currently scrobbling track will show up, including related artists, tags, biography, and scrobble statistics. Tracks played from radio stations will also show you a little context as to why the track is being played. A scrobbles tab where you can see a history of what you’ve been scrobbling and find out more about those tracks. A profile tab where you can see your scrobble charts. 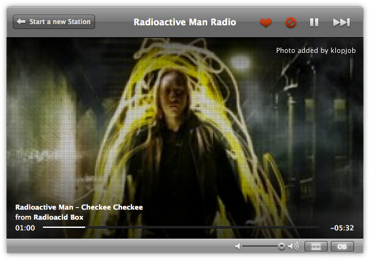 A friends tab where you can see what your friends are listening to and start their library radios. There’s also a radio tab where you can start all your usual Last.fm radio stations including a history of your recent ones. We’re looking at the app as a baseline with which we can add and improve upon. There’s been a few ideas bubbling away that we can’t wait to add, but for now the focus is stability. With a large change such as this there are bound to be teething troubles and we’ve been taking your feedback on the client support forum and making sure we address problems and implement anything we might have missed that you loved in the old app. A reminder that, like our iOS and Android apps, the desktop Scrobbler is open source and hosted on our Last.fm github page (both the liblastfm and lastfm-desktop repositories make up the desktop app) where you’ll also be able to find other things Last.fm have open sourced. If you’d like to get involved with development then head over there and fork us! It’s been a long road getting to this point and I’d like to thank all the client team members, contributors, and believers past and present for making it happen. You know who you are and you’re all very wonderful! We at Last.fm love Linux. Not only does it power almost all of the server machines that bring Last.fm to you, it is also the operating system of choice of many of our developers at Last.HQ. For our desktop application Last.fm Scrobbler, Linux is a first class supported operating system. The source code is available on GitHub if you want to have a go at building it yourself, but we also provide ready built packages for those of you who are using Debian or Ubuntu. Just go to http://apt.last.fm and find out how to install them. Today we release an updated set of packages featuring the latest version of Last.fm scrobbler (2.1.33). We are also proud to release official packages of Last.fm Scrobbler for the Raspberry Pi today. If you have not heard about Raspberry Pi, it is an ambitious project to bring better teaching of programming and the technology behind computers to children. The Raspberry Pi Foundation is a charity that has designed and developed a mini computer that costs less than £40 and allows not only children to dive into the world of computer programming. Being so cheap, the Raspberry Pi has also attracted many hackers to make new things based on this mini computer. Media centre solutions are already very popular, which is not surprising because the Raspberry Pi has a network interface and video and audio outputs. 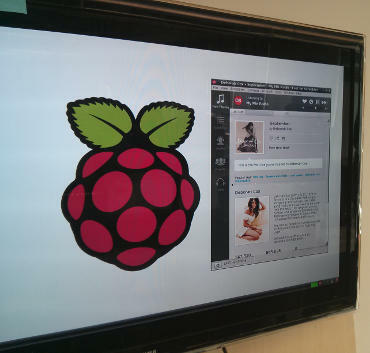 We now contribute our Last.fm client application to the Raspberry Pi universe. If you have a Raspberry Pi and are running the Raspbian operating system on it, then head over to http://apt.last.fm quickly and install Last.fm Scrobbler for Raspberry Pi! Our latest offering of open source software from the Last.fm headquarters is last.json, a JSON library for C++, that you can now find on GitHub. If you are coding in C++, need to work with JSON data and haven’t found a library that you like, do check it out. We at Last.fm benefit a lot from open source software. Almost all our servers run Linux, the main database system runs PostgreSQL, and our big data framework for data analysis is based on Hadoop, just to name a few examples. Of course, not the entirety of all software needed to run Last.fm is freely available. We have had to write lots of code ourselves. When a building block is missing in the open source software universe that we have to carve ourselves, and we think our solution is good and is general enough to be useful for other people, we like to contribute back to the community and release it as free and open source. You can imagine how this can be used to describe virtually any data structure. It is much simpler than XML and many other data formats. And the good thing is that not only computers are able to read JSON, humans are, too! As you can see in the example, not only can you read the data, you understand immediately what it is about. More often than not, JSON data is self-explanatory. Unfortunately, less so in C++. C++ is strongly typed, which means that you always declare a variable with a specific type. It can be a number or a text string if you want, but you have to decide which one it shall be at the time you are writing your programme code. There are standard types for lists and mappings, too, but those require their data members to be of identical type. So you can have a list of numbers, or a list of strings, but not a list of items that could individually be a number or a string. We use C++ for many of our backend data services, because it is fast and not resource hungry. If you have a good level of understanding, you can do great things in C++, and we love to use it for certain tasks. When we first wanted to use JSON for data exchange in our C++ programmes, we looked for a good library that makes it easy to juggle with JSON data, but we couldn’t find none that really satisfied our needs. So we spent some time writing our own library. And because we think it’s not too bad, and other people might have the same needs, we have now open sourced it under the MIT license, which basically means that you can use it freely in your own projects, but we refuse any liability for bugs or whatever could go wrong with it. << "Second similar artist: "
<< "Top track last week: "
<< "Error processing JSON data: "
last.json tries to make working with the JSON data as easy as in scripting languages. This was just an example, and last.json has many more cool features. So if C++ is your language of choice, go and check it out now. The open source tool balance is an essential part of the service infrastructure here at Last.fm. Multiple instances of balance are running on each and every web server node, on the various production back end servers, and also on our development machines. So at any given time there are probably thousands of instances running simultaneously on our machines. balance is a so-called load balancer. It is generally used as a proxy to distribute a large number of incoming requests to a group of servers. In other words it is responsible for balancing the load between all the servers in a group. Quite often, load balancers are dedicated hardware products. However, balance is a software load balancer, which means it can just run as an additional program on any server. In addition to load balancing, balance also supports a scheme called failover. This means you can define a second group of servers and balance will route requests to the second group if all servers in the first group fail. This failover scheme is used by most of our backend services at Last.fm. We usually have a main server and a backup server that kicks in once the main server fails. One day we had to take down the main server for one of our backend services to replace a hard drive. The backup server was running fine and we relied on balance to take care of routing all requests through to the backup box. Unfortunately, shortly after the main server went down, we noticed that most requests to the service failed. What had happened? balance has a configurable connect timeout, i.e. it tries to connect to a service and then waits for a certain amount of time until it figures out that it can’t connect. If the server machine is running, the connect will fail almost instantly if the service itself is unavailable. However, if the server is down, it’ll wait until the connect timeout has elapsed. So in our case, balance was trying to connect to the main server (which was down) and then waiting for 5 seconds before attempting to connect to the backup server. In the meantime, the client had already given up (it was using a much smaller timeout). balance would only notice that the client had given up by the time it had established the connection to the backup server. The next time the client tried to connect, the same thing would happen all over again. But someone else would certainly have had the same problem before? I’m quite sure of that. And I guess that’s what caused the autodisable feature to be added to balance. When this feature is being used, balance will automatically disable servers that it fails to connect to. The downside, though, is that there’s no way to automatically enable servers again. And manually enabling them isn’t really an option given the number of instances of balance we’re running and given that it could cause all servers to be permanently disabled in case of, for example, temporary network failure. We had to face the fact that in theory we had a really nice redundancy scheme, but it could fail quite miserably in practice. So I began to look around for alternatives to balance and found a couple of other open source load balancers. Sadly, all of them had either been abandoned by their authors, failed to build out of the box or just didn’t fulfill our requirements. balance was actually just what we needed. The only thing it was missing was support for monitoring all back end connections and dynamically disabling and enabling them as they fail or pass the monitoring checks. So eventually I started looking into adding exactly that functionality to balance. Implementing monitoring for balance was relatively straightforward, even though it made me aware of how much I had gotten used to developing software in C++. With balance being written in pure C, I was really missing exception handling and the C++ standard library. The amount of code changes was massive considering the rather small code base of balance. As of now, more than a thousand lines of code have changed and another thousand lines have been added. So we decided to fork the original project and rebrand it as balance.fm. It took about a week to refactor the existing code and finally add the monitoring feature. Along the way of adding monitoring, quite a few bugs have been fixed as well (for details, just have a look at the commit log if you’re interested) and I hope these fixes make up for all the bugs that I’ve undoubtedly introduced by adding loads of new code. The balance.fm code has since been reviewed by the MIR team here at Last.fm and is available from github.com/lastfm/balance.fm. If you have an application for balance.fm, please give it a try and let us know what you think and like or dislike about it! Hey, look! It’s a pause button! I know right?! That’s almost true anyway. It’s been a big challenge to implement, and we’ve spent a little while testing this feature — writing some supporting infrastructure and making sure the feature works well across our different players. 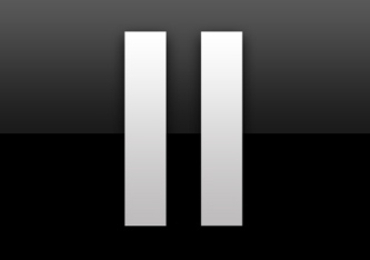 That’s right, the Android and iPhone client also now come with pause too. We’re working on a new version of the desktop client now, and that will come with pause too. I’ve been getting a ton of use out of it and I hope you guys do too! The specs are now available for partner players (like XBox and Windows Phone 7) to support the feature, and we’ll be updating the FAQ as and when they’ve implemented it. Drum Roll – It’s time for the main feature! But… but but but, we’re also releasing something new and exciting into the wild today. Whenever you tune into a radio station on Last.fm we build a playlist of tracks based on various criteria: for Recommended Radio we’re looking at music that you might like based on what you’ve been listening to recently; for Friends Radio we’re looking at what your friends have listened to recently… and so on and so forth. Up until now we haven’t surfaced why a particular song is being played to you, but that’s about to change with a little feature that puts some info text in the top left of the player. When you’re listening to Similar Artist Radio or your Library Radio we’ll show you some information about the track being played (the song selection is kinda obvious — it’s in your library, or it’s similar to the artist you typed in). Things start to get a little more interesting when you’re tuned to Friends, Neighbours, Recommended or Mix radio. You’ll see information about which artists or users fed into the song selection. If you click the “more” link you’ll scroll down to where there’s a little more detailed information; maybe it’s a few of your friends or a few artists that inspired the selection. Hope you enjoy them! Remember, you can always offer feedback about features like these on the forums, and if you want to join the team who made them just head to the Jobs page. It feels like just the other week that I posted this on the Last.fm developer forum to get feedback and ideas on a new version of our scrobbling API that we were mulling over. For those less technically-inclined, the scrobbling API defines how data gets transmitted to Last.fm every time you listen to a song. Scrobbles are incredibly important to us. They’re the building blocks of your music profile, and put together, they power basically everything that Last.fm knows about music. The current API does a decent enough job, but we’ve had many developers complain about it being inconsistent with the other ways of accessing Last.fm data (via our web services) and its rather shoddy feedback on errors. We also wanted to make the API more extensible so that we could define certain information which must always be submitted (like track and artist name) while allowing us to provide extra functionality in future via optional fields that wouldn’t break existing scrobblers. Our scrobbling servers get a lot of traffic – at certain times of the day we have nearly 800 people telling us what they are listening to every second, and we are nearing our 40 billionth scrobble! There are also many different ways to scrobble the music you’re hearing, some developed by us (such as our official Last.fm, Android, and iPhone apps) as well as applications developed by third parties and music-loving geeks from all over the world. 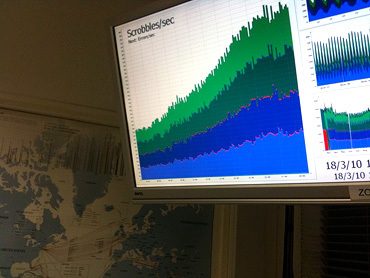 Scrobbles-per-second monitor in the Last.fm operations room, powered by CactiView. All told we have more than 600 scrobblers created by people other than us, covering popular online services like Spotify and The Hype Machine, hardware devices like the Onkyo TX-NR807 and the Logitech Squeezebox, as well as online storage services like Bitspace, extensions for browsers like Chrome (via Chrome Scrobbler), Opera (via Seesu) and Firefox (via FoxyTunes), and finally, for the real geeks, plugins for Gnome’s totem player and a promising-looking fork of Amarok called Clementine, to name just a few. A fair share of all existing scrobblers is listed on build.last.fm – browse around if you’re curious! Given the heavy use of the current scrobbling API, releasing a new version of it is not something we take lightly – which is why it’s taken more than a year to get to where we are today. My post back in January 2009 generated pages of suggestions, plenty of e-mail conversations with developers and led to many hours of internal discussions and arguments involving nearly everyone in the company in some way. We are finally able to unveil our first draft of what the new API might look like. Please bear in mind that this is not complete or final; we’re releasing it as a “request for comment” from the developer and user community. All the technical details can be read on our forum here and we’d like to keep detailed discussion there. We’ll be monitoring the post and taking feedback onboard. The scrobbling API will become a fully-fledged member of the Last.fm Web Services under a new “Scrobble” package joining its friends Track.love and Track.ban instead of being all sad and lonely on the sidelines. This should simplify things for developers by having one unified authentication, request and response mechanism. We also hope that this will lead to applications which currently just scrobble to use the rest of our API and vice-versa, with the end result being cooler apps with more features for everyone. Migrating to the web services will improve our ability to track the use of scrobble applications, so we can do groovy things like charts of the most popular scrobblers, and analyses of musical tastes across different scrobblers. Yes, we will finally be able to answer the burning question – “Do Amarok users have better taste than XBox Live users?” We hope that our scrobbling partners and their users will be able to do cool things with this data. Corrections information will be returned where relevant so users can be prompted to fix any incorrect metadata they may have. 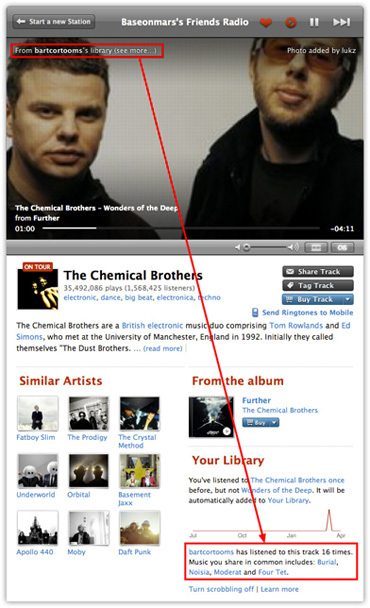 Changes to Last.fm radio scrobbling will allow us to improve our recommendations. We’ll get more specific listener feedback because loves, bans and skips can be tied to a specific radio stream, not just to a particular track. We’ll return more detailed error messages which should simplify the process of developing a scrobbler. Third party developers will be able to upload their own icons which will show up on a Last.fm user’s profile when they are listening with a particular scrobbler. We currently provide this as a service for our most popular scrobblers but will extend this to all third party apps (this was our most requested feature after improved error logging!). There were a lot of great ideas which didn’t make the cut, but the new API should allow us to add new features more easily and we plan to expand on this release in the future. After a round of feedback from the community we hope to put a beta version of the API out for testing and will then work towards finalising it a month or two after that. Third party developers will then be able to start updating their existing applications (or writing new ones) and passing the benefits of the new features on to you, our faithful users. We’re hoping that by making scrobbling development easier we will be taking more steps towards getting every musical device on the planet scrobbling. Let us know what you think.